Atopic dermatitis, more commonly known as eczema, is a chronic condition that causes inflammation of the skin. Symptoms can include constant itching, bumps, discolored patches, thickened or scaly skin, rawness and swelling, usually on the arms and knees, although eczema can affect any part of the body. Although the initial and most important form of treatment is a topical corticosteroid, you must also supplement your diet with adequate amounts of water to prevent excess drying, as the skin already lacks the proper compounds to effectively retain water. Drink mineral or remineralized water instead of tap water. According to a March 2009 study published in the journal “Water Research,” natural minerals might help to significantly reduce the negative effects of eczema. Consume deep-sea water, also known as “amami no mizu.” Deep-sea water has a cold temperature and abundant nutrients, and is free of pathogens. A September 2005 study published in the “European Journal of Clinical Nutrition” found that drinking this specialized water improved the skin symptoms of 27 out of 33 eczema sufferers. Aim to drink eight 8 oz. 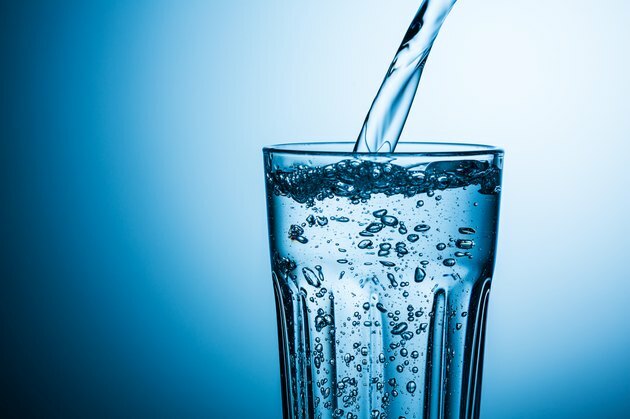 glasses of water each day to prevent further irritation to your skin. This is particularly important if you’re physically active, in which case, you need to replace lost water from sweating.